Asterisk voice prompts in Australian English. All Professionally sound recorded by native speaking voice artists. Australian English Voice Prompts for Asterisk, FreeSWITCH and A2Billing. When it comes down to how your business sounds, there is only one factor that really matters; the voice of the person who answers the phone. Our Native speaking voice artists are not only Australian English, there from the top Australian English voice artists in the industry. The Australian English Asterisk product contains every voice prompt that’s needed for each and every feature of Asterisk, AsteriskNow, Elastix, Callweaver, Trixbox and FreePBX. With additional voice prompts for a2billing in the a2billing version. If there’s a feature that needs a voice prompt, then we have it in the product. 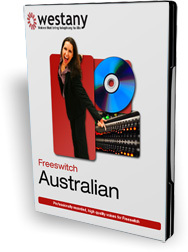 The Australian English freeSwitch product contains each and every voice prompt that’s needed for every feature of freeSwitch, blue.box and pbxWare. If there’s a feature that needs a voice prompt, then we have it in the product. And to keep your calls as high a quality as possible, every voice prompts is encoded in 8k, 16k, 32k and 64k wav format to match the appropriate codec.